The Free Peoples of Men, Elves, Dwarves, and Hobbits keep many tales and songs and legends of the glorious deeds of their longfathers. In the Elder Days, the deeds of heroes were of a mythological stature and beyond the power of those in younger days to achieve. When the names of Eärendil the Mariner, great among both Elves and Men, and Durin the Deathless, Father of the Longbeard Dwarves, are invoked by the minstrels, the listener is filled with wonder, for their deeds are are mighty indeed. But the Hobbits belong to the younger days, not the Elder, and thus the deeds of their most legendary figures are less awe-inspiring in nature, yet no less important to the halflings; for Marcho and Blanco were the founders of their beloved Shire. The Hobbits first come into the histories of Middle-earth when they dwelt in the upper vales of Anduin. Where they had come from is not told, but in time, they became divided into three kindreds: the timid Harfoots, the riverside Stoors, and the bold Fallohides. Unlike the other two kindreds, the Fallohides maintained a hunting tradition, and thus were naturally more adventurous and inquisitive. They were also more friendly with outsiders, especially Elves, and from them learned to love the trees and forests and gained skill in song and story. When evil began to stir in Mirkwood, the Hobbits grew afraid, and began to leave their homes in the vales of Anduin and move west across the Misty Mountains. The Fallohides crossed the mountains at the sources of Hoarwell, north of Rivendell, and from there began to move west across Eriador. In time, they settled in the country around the Bree-hill, for they found that some of the Harfoots had already made homes there. Because of their daring natures, the Fallohides were easily accepted as leaders and chiefs by the Harfoots. After dwelling in the Bree-land for three hundred years, two bold Fallohide brothers, Marcho and Blanco, wished to lead a group of hobbits further west in search of new lands to settle. Knowing that the lands west of Baranduin were the royal hunting grounds of the King of Arthedain, they journeyed to the city of Fornost Erain and were there granted formal permission by King Argeleb II to settle them. The requirements of the King were that the Hobbits uphold the laws of Arthedain, keep the bridges in good repair, foster the land, speed the King’s messengers, and finally, that they allow the King to hunt the forests and moors thrice each year. With this agreement in place, Marcho and Blanco led their followers across the Bridge of Stonebows and came for the first time into the fertile lands that would become their Shire. In time, they would be joined in their mild and bountiful land by the Stoors, coming up from Dunland, and the three kindreds of Hobbits became mingled. The names of Marcho and Blanco both mean “horse” (Old English mearh “horse” and blanca “white horse”) and they are of course analogous to Hengest and Horsa, the semi-legendary founders of Anglo-Saxon England whose names also both mean “horse” (Old English hengest “horse, gelding, stallion” and hors “horse”). Like the followers of Hengest and Horsa, the Angles, the hobbit-followers of Marcho and Blanco had once dwelt in a region called the Angle — the triangular area of land between Mitheithel, the River Hoarwell, and Bruinen, the River Loudwater. Thus, the Hobbits can be seen truly to be English (that is, Angle-ish, the people of the Angle) and the Shire to be England (the land of the people of the Angle). This is the third and final installment of the “Legends of the Free Peoples” collection. Since I couldn’t very well do just one outfit for Marcho and Blanco, we have a fourth bonus outfit for the collection! Once again, I’m working with the purple, rose, gold, and white colour scheme created by using pieces from the level 65 Annúminas sets and blending them strategically with other pieces. I don’t usually put boots on my hobbits, but I felt it was necessary to really sell this complex colour scheme. In making these outfits, I noticed that the spring festival tunic used on Blanco has been changed; originally the central part of the tunic was an undyeable dark green, but now the whole thing dyes — so if you had been avoiding using it for that reason you can dye away to your heart’s content. I had a really good time putting together all four outfits for this collection, and I hope you’ve enjoyed them as much as I have! Tips: If you want to bring some gold into the headpiece of Marcho’s outfit, you could try the Shadow-stalker Helm (bartered Last Homely House Burglar trader or ceremonial version bartered — skirmish camp cosmetics vendor/Helegrod Cosmetic Clothing – Medium), dyed purple or rose. Marcho’s leggings have the same appearance as the Trousers of the Mighty Verse (bartered — Twenty-first Hall Minstrel trader). In the deeps of time, before the Sun and Moon had risen for the first time over Arda, and before the kindreds of Elves and Men had awakened, the smith-Vala Aulë grew impatient for the coming of the Children of Ilúvatar. He longed for creatures to love and instruct, and therefore he made seven beings of his own. He ensured they were stout and resilient to injury, for Aulë knew that they must be able to withstand the evils of Morgoth in Middle-earth. Aulë began to instruct his creatures in the language he had devised for their use when he was rebuked by Ilúvatar, who said that Aulë had not the power to create, only to make, for Ilúvatar alone is the master of the Flame Imperishable. Aulë saw that unless his will was bent on his creatures they would merely stand dumb and lifeless, and he humbled himself before Ilúvatar, saying that a child who plays at his father’s work does it not in mockery but from love. He prepared to destroy his seven creatures but Ilúvatar stopped him. Then Aulë looked in wonder on the beings he had made, for he saw that they shrank back in fear from his unfallen blow. Ilúvatar had accepted Aulë’s repentance and adopted these seven creatures, Khazâd in their new language, as children of his own; and he had granted them true life and being with the spark of the Flame Imperishable. But Ilúvatar would not suffer his adopted children to come before his own. Therefore, he commanded Aulë to lay the Khazâd to sleep in deep places beneath the surface of Middle-earth. Each was to be laid with a mate save one, the eldest, Durin. When the time of the Khazâd, or Dwarves as they came to be known in the Common Speech, came at last, Durin awoke deep beneath Mount Gundabad at the north end of the Misty Mountains. He left the caverns beneath the mountain and wandered south, seeing many hills and dells that no-one had yet laid eyes upon, and he gave them names. At last he came to a deep valley beneath three mighty peaks, in which was laid a pool with a dark and glass-like surface. Durin peered into the cold, still waters and saw that they reflected the stars in the sky above him, seeming to form a glittering crown above the reflection of his head. He took this as a sign, and went up into the mountains above the pool, finding there great caves. He explored them and in time with the help of other dwarves who came to serve him, the caves were worked and expanded and wrought into the great mansion of the Dwarrowdelf, Khazad-dûm. Durin was accepted as the king of those dwarves that had come to serve him, and thus he became the Father of the Longbeards. He reigned as their king for untold years. His lifespan was so great that he was called Durin the Deathless, and he lived to see the rising of the Sun and into the First Age. Under his rulership Khazad-dûm became rich and mighty, lit with crystal lamps set with the light of the Sun, Moon, and stars. Great works of skill, cunning, and beauty were wrought there, for the Dwarves, like their maker, excelled at crafts of the hand. Gems and arms were laid in horde, the throne-room of Durin was roofed in gold and floored in silver, and runes of power were carved upon its door. But long-lived as he was, Durin was not immortal, for that is the lot only of the Firstborn of Ilúvatar. In the fullness of age he died, having lived for ten lives of his kind, but the Dwarves say that when he died, the stars of his crown reappeared in the glassy surface of the Mirrormere, visible there until Durin should wake again in another mortal body and once again take up his throne. Indeed, there were another six Durins, believed by the Dwarves to be reincarnations of the original Durin, and they all bore a great resemblance to him. At the time that Gimli son of Glóin looked upon the Mirrormere the seventh and final Durin had not yet been born. He would come in the Fourth Age, and would lead the Longbeards back to Khazad-dûm, reclaiming it at last. The Longbeards would live in the restored Dwarrowdelf until the world grew old and the mountains grey, and the race of the Dwarves failed at last, and the days of Durin’s folk were ended. This is the second in the three-part “Legends of the Free Peoples” collection. Again, I’m working with the same purple, rose, gold, and white colour scheme that I used with Eärendil last week. It’s a pretty bold colour scheme that requires a suitably epic context. I really like the story of the making of the Dwarves by Aulë. It reminds me a bit of the biblical story of Abraham, another father who offered to sacrifice his son but was stayed at the last minute and went on to enjoy great prosperity. I also like that the reason for the strangeness of Dwarves in the eyes of Elves and Men — their stunted appearance, their lack of sexual dimorphism, and so on — can be attributed to the fact that Aulë, not knowing the mind of Ilúvatar, had only an imperfect idea of what the as-yet unawakened kindred of Elves and Men would be like. Durin is a name taken from Dvergatal, “the Tally of Dwarves”, in Völuspá, the first poem of the Old Norse Poetic Edda. The name Durinn derives from Old Norse dúrr “slumber, a nap”, so the name means something like “Sleepy” — a fitting name for the Father of the Longbeards, whose life began with sleep beneath the mountains and whose spirit is said to slumber until being reawakened in distant descendants. Tips: At the time of writing, the circlet in this outfit is available to purchase for mithril coins at Lalia’s Market. Depending on the character you used to earn the shoulders from the Beorning introduction, you may have to use the alternative shoulders (the two shoulders swap appearances on male and female characters). The other shoulders are called Grimbeorn’s Shoulders (quest reward — Beorning intro  Preparations for Travel). If you don’t have access to the cloak used in the outfit, a nice alternative is Brosh’s Cloak (looted — Great Goblin/Seat of the Great Goblin). Experiment with rose, violet, indigo, and purple dye to get the perfect colour. Eärendil the Mariner was of the Half-elven, descended from all three Houses of the Edain, the Fathers of Men, through his father, Tuor, called Eladar that is Starfather; and from the House of Fingolfin through his mother, Idril, called Celebrindal that is Silverfoot, daughter of Turgon the Elvenking of Gondolin. Eärendil was born in Gondolin and was but a child of seven years when the city fell to the flames of the dragons of Morgoth the Enemy. He was carried from the wrack of the city by his mother’s servant and brought to safety in Arvernien at the Mouths of Sirion. There, Eärendil grew to manhood and wed Elwing, also of the Half-elven, for she was the daughter of Nimloth and of Dior, son of Beren and of Lúthien, daughter of Thingol and Melian the Maia who came from the West That is Forgotten. Therefore, the lineage of the of the twin sons of Eärendil and Elwing was lofty indeed, and they were named Elrond and Elros. With the aid of Cirdan the Shipwright, Eärendil built a mighty vessel, Vingilótë the Foam-flower, and he set sail on a voyage of many years, seeking in vain the shores of Valinor where he hoped to beg, on behalf of Elves and Men, the aid of the Powers of the West against Morgoth in Middle-earth. While he was away, the haven of Arvernien was attacked by the sons of Fëanor, for word had reached them that Elwing held in her possession a Silmaril, one of the three Great Jewels wrought by their father. Rather than be taken, though, Elwing grasping the Silmaril flung herself into the sea. But she was not killed. She was borne up out of the waves by Ulmo, the Power governing the Seas, who clothed her in the form of a great white sea-bird; and the Silmaril shone upon her breast. “A pale flame on wings of storm”, she flew to Eärendil’s ship, and there regained her own shape. She bound the Silmaril upon her husband’s brow and it blazed with light, helping them to steer the ship through the shadowy Seas of Evernight and come at last to the shores of Valinor. He was brought before Manwë who, because Eärendil had not sought the Undying Lands for his own sake but rather for the Two Kindreds of Elves and Men, forwent the lawful punishment for setting foot upon those shores, which was death. And because Eärendil and Elwing were descended from both Elves and Men, Manwë granted them, and their sons, the choice of which kindred to belong. Eärendil would have chosen to be counted among Men, but for the sake of Elwing, who chose to be counted among her mother’s people, he chose to numbered among the Elves. But Manwë decreed that neither should return to dwell again in Middle-earth. Then, having heard Eärendil’s plea, Manwë commanded that the Powers of West arise, and they went with great hosts to Middle-earth, and they assaulted Morgoth’s fortress of Thangorodrim and the tumult of battle was terrible. Eärendil accompanied them, for Vingilótë was given wings of light that she may sail the skies instead of the seas, and he did battle with and threw down the greatest of Morgoth’s dragons, Ancalagon the Black. After the battle, Eärendil was set to sail the skies for ever in his ship of light, with the Silmaril blazing on his brow, coming before the Sun and Moon, the Evening Star beloved by those in Middle-earth. Elwing dwelt in a tower on the shore of Eldamar, and there befriended the seabirds and learned their tongue. In time, she learned to array herself in their shape, and would on a time fly on rose-stained white wings up to meet with her husband on his eternal voyage, for he now was become the most beloved of the stars to the Elves, and to Men, he was called the Flammifer of Westernesse. Eärendil’s story and the song associated with him are among my favourites. The song has an especially tangled history, beginning with Tolkien’s poem “Errantry” which is also very delightful. The wonderful meter devised by Tolkien is particularly complicated, relying on internal trisyllabic assonances. If you have the opportunity, listen to the Tolkien Ensemble’s rendition of the Song of Eärendil. They do a great job of it (as they do with all Tokien’s songs and poems). The character of Eärendil was partly inspired by a name from Germanic mythology meaning “luminous wanderer”. In Old Norse mythology, the name belongs to Aurvandil, whom Thor bore out of the frozen north in a basket on his back. But one of Aurvandil’s toes had stuck out of the basket and become frozen; Thor broke it off and cast it into the heavens, where it became a star. In the Old English poem Crist I, ēarendel refers to the morning star heralding the coming of Christ. The poem contains the line, ēala ēarendel engla beorhtast “hail Earendel brightest of angels”, very similar to Tolkien’s “Aiya Eärendil, elenion ancalima!“, Quenya for “Hail Eärendil, brightest of stars!” As for Elwing, her story is strongly reminiscent of that of Alcyone from Greek mythology. Alcyone married Ceyx, who was the son of Eosphorus the Morning Star. Alcyone and Ceyx liked to privately refer to one another as Hera and Zeus, and this of course angered the real Zeus, who hurled a thunderbolt at Ceyx’s ship while he was on a voyage. When Alcyone found out her husband’s fate, she hurled herself into the sea, but the gods took pity on them and turned them both into kingfishers — halcyon birds. The path of Elwing as a sea bird rising up to visit Eärendil as the evenstar seems similar to the planet Mercury’s trajectory, rising to meet the more brilliant “star” of Venus and then falling back toward the horizon. For more on this interesting theory, see Larsen, “Sea Birds and Morning Stars” in Tolkien and the Study of His Sources, edited by Jason Fisher. One final note related to Eärendil’s choice of kindred to which he would belong: it’s a personal pet-peeve that Eärendil’s descendant Arwen is sometimes depicted in discussion or fan-fiction as having the same explicit choice of kindred as Eärendil, Elwing, and their sons, Elros and Elrond. The children of Elros and Elrond were not given a choice, but must abide by the decisions of their fathers. Thus the children of Elros were mortal, albeit with very long lives. Although Elrond had chosen to be counted among the Elves he had not returned to Valinor, and his children were born in Middle-earth. Therefore Arwen (and her brothers Elladan and Elrohir) had the life of Eldar only so long as they lived in Middle-earth with their father. When he departed to sail into the Undying Lands, they could, if they chose, accompany him and retain the life of the Eldar for ever, or remain in Middle-earth and live as mortals. Ultimately, that is the choice all three made: to remain after their father’s departure, and eventually taste the bittersweet gift of mortality. We haven’t had a “collection” for a long time here at The Starry Mantle, so I’m pleased to introduce this new one, based on the legendary figures of the Free Peoples. Eärendil here is representing a hero of both Elves and Men. This collection is based on a colour scheme of purple, rose, gold, and white, created by using components from the epic Annúminas armour sets and mixing them with other pieces. Since the colour-scheme is so flashy, I thought that the context of the collection had to be something grand and mythological. The opportunity to use the really lovely Annúminas heavy shield is probably the ultimate inspiration for the whole collection. If you saw my little teaser on Twitter yesterday, you can see that that set of screenshots didn’t make it into the final post. I originally wanted to take my pictures of this outfit in Ost Elendil, because the colours there coordinate nicely with this outfit. Ultimately, though, it was too dark in there and I had to scrap the idea. Instead, I took my Eärendil out to the corsair ships south of Dol Amroth to give him a nice shipboard backdrop. Tips: The shoulders in this outfit have the same appearance as the captain and champion shoulders available from the same Adventurer’s Quartermaster in Galtrev. The cloak is also available at the time of writing from Lalia’s Market. As an alternative the shoulders in this outfit, you could use the Berserker’s Shoulders (bartered — Ost Galadh Champion trainer), dyed violet, or the Shoulders of the Lady’s Power (bartered — Caras Galadhon Champion trainer), which have the same appearance. Likewise, helm skin from those two sets look great with this outfit as well. A nice alternative cloak is the Cloak of the Boar-clan Warrior (quest reward — Dunland  Lost Miner — Siam), dyed purple. A cloak with the same skin is also available at Lalia’s Market at the time of this post’s writing. The Elves of the Golden Wood kept vigil upon the borders of their forest-realm from wooden flets or platforms built high in the branches of mallorn trees. The flets were built with openings around the great boles of the trees, and were furnished with movable screens that could be positioned to provide shade or shelter from the wind. They were reached by long white ladders of hithlain, the wondrous rope of Lórien, which could be drawn up to the surface of the flet to ensure that trespassers could not climb up. Flets were also used as residences by the Elves of Lothlórien, but this was not universal. Most flets used as dwellings were found in Caras Galadhon, the fortress-like city of trees which was the heart of the Golden Wood. The idea of living upon flets was introduced by Amroth, once the king of Lórien, who built one high in the mallorn tree crowning the hill that bore his name. He chose to dwell upon a flet because of his love for Nimrodel, who may have been the first to build a home in this style in the branches overhanging her beloved river Silverlode. This maiden of the Galadhrim is a flet-runner, one of the march-wardens who keep watch from high perches on the borders of Lórien. She knows by heart the location of each flet around the Golden Wood’s perimeter and may spend months at a time stationed at a particular flet before moving to another. She is armed with one of the renowned bows of her people, for the lofty flets offer an excellent position to fire upon intruders. She also wields two curved knives in the event that she must descend to the forest floor in defence of the borders. Her attire is light and loose, a combination of soft, muted greys, greens, and deep blues, perfect camouflage among the silvan shadows, especially at night. Ever vigilant, her keen eyes peer out from under the shadow of her elven hood. Flet is an archaic English word originally meaning, “the floor, the ground”. It later gained the sense of “a dwelling, a habitation”. The flets of Lothlórien embody both senses exactly. In Sindarin, they were called telain (singular talan). I was inspired to make this outfit by the in-game title “Flet-runner”, which can be earned by completing the Flet-funner Challenges deed. The deed begins with the quest “At Home Among the Trees” (level 60) bestowed by Celechest in Caras Galadhon. As many readers are no doubt aware, the long-standing bug which prevents weapons from being displayed when you execute skills outside of combat can make taking outfit screenshots difficult if you want to show off your weapons. It was even harder trying to figure out a way to get them to display on the Lórien flets, since there are no mobs up there to enter combat with. At first I tried to enter combat with an animal on the ground and climb up the ladder into a flet. But this immediately took me out of combat and my weapons were sheathed. Finally I figured out a cunning solution! A few of the flets have sentinel elves patrolling around their bases. I went to Talan Brethil, which has a sentinel, and lured a boar over to the sentinel, who immediately attacked it. I was then able to climb up to the flet, remaining in combat until the sentinel had dispatched the boar. Tips: The hood in this outfit is great to use with cosmetic tunics because it has a piece which covers the throat and upper chest (where tunics leave your character’s skin exposed). The quiver may also be available from the Cosmetic Loot Boxes available during LOTRO’s anniversary event. Another tip for getting weapons to stay in your hands for screenshot purposes is to execute a self-targeted skill just as you are sheathing your weapons after combat. I find that wound-removal skills are especially good for this (I’ve tested successfully on guardians and champions so far). You will find that your weapon(s) remain in your hands and will stay there until you hit a loading screen or until you use an emote or enter stealth. Osgiliath was of old the chief city of Gondor and the residence of its kings. Athwart the mighty Anduin, the city controlled the river crossing from Ithilien in the east to the town-lands of the Pelennor and Minas Tirith in the west. Because of its strategic location, the city’s history was fraught with strife. The hosts of Mordor took Osgiliath during the Second Age, and the city was only reclaimed when Sauron was defeated by the Last Alliance of Elves and Men. Later, during the Third Age, the forces of Castamir the Usurper laid siege to the city during Gondor’s civil war, the Kin-strife. The Usurper’s forces sacked and burned the city, forcing King Eldacar to flee to his kin in Rhovanion. The city was again reclaimed in the name of the right king when Eldacar returned and the rebellion was put down, but its population was later decimated by the Great Plague of III 1636. The city began to fall into ruin, and the king relocated to Minas Tirith, making it the chief city of Gondor. When Minas Ithil was captured by Mordor in III 2002, Osgiliath became extremely vulnerably to attack, and many of its people fled west to safer parts of the realm. In III 2475, the forces of Mordor took the city again and the city was finally deserted of all its inhabitants. Nevertheless, the Steward of Gondor would not suffer it to be held by the Enemy, and his forces wrested back control from the occupying Uruk-hai. Osgiliath then became a disputed ruin, the western shore defended by Gondor’s forces and the eastern repeatedly attacked by Mordor’s. Finally, in the summer of III 3018, in the opening offensive of the War of the Ring, Sauron’s forces, led by the Ringwraiths, came forth and took the city. The last bridge across Anduin was thrown down. The Rangers of Ithilien continued to defend the city’s western shore from the Causeway Forts, but the eastern shore was now firmly under the control of Sauron’s forces. This man is a warrior of Gondor under the command of the Lord Faramir, son of the Steward Denethor. He is arrayed in strong mail and proudly bears the winged helm and shield of Gondor. They have served him well already, for the fighting has been fierce, as evidenced by his tattered cloak. He has come here to Osgiliath’s western shore with his company for, as the seige of Gondor draws near, the Steward has commanded his son to take what forces he may and make the Enemy pay dearly when at last he comes to cross the river. When this defense fails, as it must, Faramir’s forces will fall back to Causeway Forts, there to try against all hope to hold out. But the skies are now permanently darkened by the fumes of Mordor and the shrieks of the Ringwraiths can be heard among the crumbling buildings and shattered monuments of the east shore. Have the Men of Gondor any hope against the Shadow that rises in the East? I always keep an eye out for cosmetics with a wing motif to use in Gondor-themed outfits, so when I came across the shield recently I was excited to put it to use. Even more so because of the upcoming addition of cosmetic weapons and shields to the game. I’m looking forward to setting up my shield-using characters with coordinating pieces. Are there are shields you’re especially looking forward to equipping cosmetically? Tips: The shield that I used in this outfit has an equip level of 59 if you trying to find a place to keep an eye out for it to drop. Lothlórien or Mirkwood might be good places to grind mobs looking for it. As mentioned by my fine fellow outfitter Gloredh, below in the comments, there is another shield with the same skin: the Light Shield of the Golden Host (crafted — metalsmith T6/Malledhrim reputation/light shield). You can get the recipe for this shield by bartering 25 Malledrim Bronze Feathers with the Friend of the Malledhrim Crafting Vendor in Ost Galadh, Southern Mirkwood. 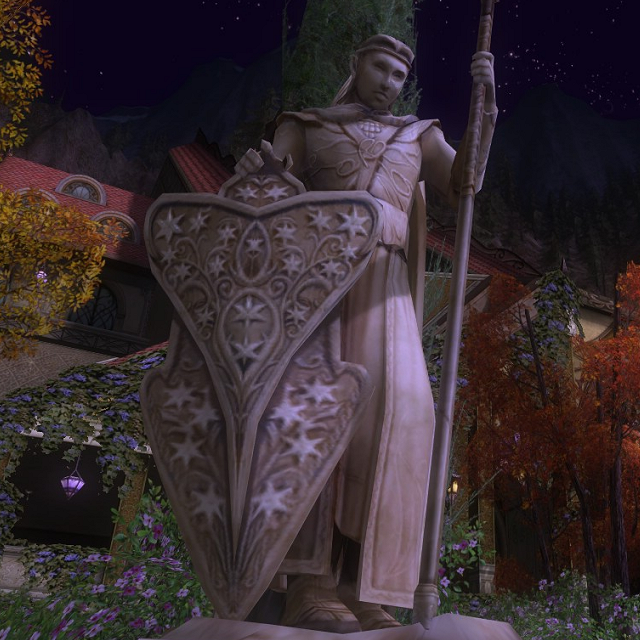 This Thursday past it was confirmed that cosmetic weapons and shields are finally being implemented in LOTRO! The system is now being previewed with Update 16.2 on the Bullroarer test server. Gloredh of Wandering Around Arda has also done a really nice preview showing how the new cosmetic slots work. This is something that I’m sure many other cosmetics enthusiasts have been hoping for for a very long time now, and I have to say that I was very pleasantly surprised to hear about it! In fact, I’d given up hope that it would ever be added. I’m pleased to be proved wrong. I’m sure there will be some kinks and bugs to work out, but hopefully going forward this will be a great addition to LOTRO’s cosmetic system. In honour of this new addition to the game, here is a selection of outfits featuring coordinating shields to give you some inspiration before Update 16.2 goes live.